﻿This product is a digital PDF download. This 27-piece prayer request card set is designed to help you keep track of those you're praying for. Praying is an important way to love others. Scripture calls us to pray not only for those we love, but also for our enemies–those who curse and abuse us. What if rather than turning to social media when we’re mistreated, we instead sought the Lord in prayer, praying for those who hurt us? It’s possible to pray for people as they come to mind throughout the day. But if we’re being honest, it’s also easy to forget to pray for others altogether. To help with your prayer time, use this fun set of cards. The set has 27 double-sided pieces. In addition to being a great gift to yourself, these will make a great gift for the ladies in your life–just print them, cut them out, and tie a pretty pink or grey ribbon around them. Maybe add a couple of your favorite pens to complete the gift. 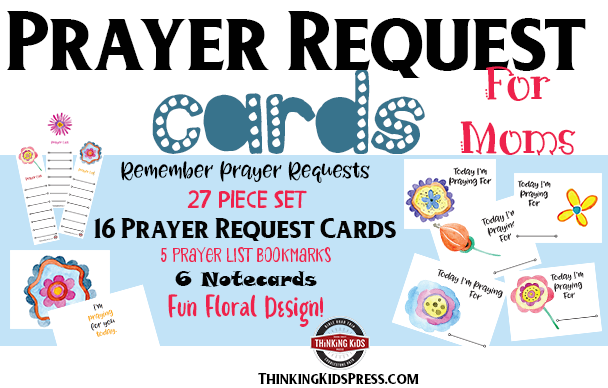 There are 16 prayer request cards. These are designed to help you keep track of who you’re praying for and that person’s needs. Simply write the name of the person you’re praying for on the front of the card, and their prayer requests (or your concerns and petitions for them) in list form on the back. If you need more than 16 cards, simply print this section as many times as you’d like. Choose a person each day to pray for and fill out a card for that day’s person. Save the card after praying and use the prayer cards on a rotation, working through one each day. Fill out a card every time you come across someone in need of prayer. You can even keep a few on hand in your purse. In a group, such as a Bible study or small group, have each lady fill out a card with their own prayer requests. Collect the cards and pray for each lady throughout the week. Or perhaps bring a stack and have the ladies partner up, filling out a card for their partner for the week. There are 5 prayer list bookmarks, each with room for 7 names. The bookmarks have a pretty graphic and a prayer list on one side, and a beautiful coordinating floral pattern on the other side. Fill out all 5 bookmarks with a different set of names and rotate the bookmarks over 5 weeks, praying for new people each week. Fill out all 5 bookmarks and place them in your Bible, journal, daytimer, bedside book, and by your toothbrush to remind you to pray for different people throughout the day. At a women’s group, print a stack of bookmarks, and have the ladies commit to pray for each other in groups of 8. They can record the names of their prayer partners. Use the bookmarks for prayer requests you often miss, like the senate or your church elders, and store the bookmarks in your Bible to help you remember to pray for institutions and those in leadership. There are 6 prayer notecards. Each has a pretty floral wreath on the front. The inside of each says, “I’m praying for you today.” Praying for a friend is a wonderful way to love them. It’s also encouraging to hear that we’re being prayed for by others. Use these cards to let someone know you’re praying. When the Lord puts someone on your heart to pray for, write them an encouraging note and drop it in the mail, letting them know you’re praying. Let your friend know what you’re praying, encouraging her to seek the Lord in all she does. Write a helpful verse or two in the card. Attach the card to a small gift, like chocolate or a bouquet of flowers, to remind a suffering friend she’s being prayed for. I recommend printing on white cardstock so the cards will be more durable and the back won’t show through on the front.